The P310 throws the gauntlet at the rest of the competition in the sub-£1,000 desktop workstation PC market. A genuine gem against which others will be measured. There was a time when workstations were expected to fit a certain template. They were meant to be big, expensive, noisy, and above all, powerful. For years, your average workstation would stick closely to this formula, but things have evolved, driven partly by the industry’s focus on power efficiency. One of these new workstations that dares to be different is the Lenovo ThinkStation P310, a relatively tiny (only 25 litres) model that is surprisingly affordable despite offering some cracking features. The P310 sits below the P410, P510, P710 and the P910, and is Lenovo’s value-offering for the entry-level 3D and 2D CAD/CAM market, offering a serious alternative to high-end desktops thanks to its ISV-certified status. The cheapest model is available for £675 (around $840, AU$1,120) at the time of writing with a three-year onsite, next business day warranty, free delivery, and that’s inclusive of VAT. For that price, you get a quad-core Intel Core i5-6400 CPU with 4GB of RAM and a 500GB hard drive, which is great but certainly not enough for your standard workstation user. There’s plenty to like about the latest entry-level candidate of Lenovo’s Thinkstation family, which is now almost ten years old. Indeed, there are several neat features that can be found across the entire series regardless of the price point. The integrated handles, for example, should be the norm by now. The front one is particularly worth highlighting as it combines an aesthetic touch (the red Lenovo signature) with a practical one (it’s made from rubber to protect the fingers of the user). Not that this machine is particularly heavy or big – at 175 x 426 x 376mm and weighing 13kg, it is just a bit bulkier than two A3 reams of 500 sheets put together. The P310 is also easy to maintain – getting inside the case still requires you to undo two thumb screws to remove the side panel, but that takes a few seconds at most. Once you’re in, adding or removing boards, memory cards or hard disk drives can be done quickly. We’re impressed by the flexible hard drive ‘caddy’ but less enamoured with the so-so cable management. Airflow is excellent thanks to a honeycomb meshed front that’s mostly empty space and allows fresh air to be sucked through efficiently via an 80mm fan at the front. Lenovo engineers came up with an elegant solution to solve the problem associated with customising I/O ports. With ‘Flex Module’ technology, they allow the end-user to easily mix and match the components they need. Around the back, our review sample came with a pair of legacy ports (Serial and D-Sub) as well as two DisplayPorts, four USB 3.0 ports, two USB 2.0, three audio ports and a Gigabit Ethernet connector. At the front are two USB 3.0 ports, a card reader and two audio connectors, together with a power button and a DVD writer. Inside there’s enough room for 64GB of RAM (across four memory slots, supporting ECC), and there are four hard drive bays (one of which is used) with options for RAID-1, 0, 5 and 10, with space even for an internal M.2 SSD. 48GB of Samsung DDR4 2133MHz RAM modules were in our system with a Crucial MX300 1TB SSD and a 512GB Samsung PM951 M2 drive. The processor in our bundled computer was an Intel Core i7-6700, a quad-core, 8-thread monster with 8MB cache and a base clock speed of 3.4GHz. That can be swapped for a Xeon E3-1200 v5 series CPU (E3-1280 v5 is available for a premium). There are four PCIe slots – x16, x4 (x16 mechanical) and two x1 – which can accommodate that M2 via an adaptor as well as an Nvidia Quadro M4000 GPU. By default, the P310 comes with Windows 10 Pro but as always, Microsoft offers a downgrade option to Windows 7 Pro. A slew of Lenovo-only applications (Lenovo Solution Advice, Reachit – which is disabled – Shareit, Thinkvantage tools and PowerEngage) are installed alongside a few usual software suspects. Surprisingly enough, all this is powered by a 250W PSU from FSP. Although it sports a respectable 85% efficiency, we’re concerned that it would prove inadequate should the end-user decide to upgrade an existing system – down the line – with more power-hungry components. We’d advise you to opt for the 92% efficient, 400W model instead to give your components more breathing space. We were pleased to see that Lenovo offers wireless connectivity (802.11ac and Bluetooth 4.0) as an affordable option. Let’s talk for a moment about the keyboard. This rarely deserves a mention, but in this case, the KU-0225 that accompanies Lenovo’s workstation is designed to look like an old-school mechanical keyboard (but it’s still a membrane type). It eschews the current design trends by opting for taller keys with a long but mushy travel and a rather wobbly stand. Still, it’s a welcome change from the identikit keyboards that usually land on our desk. The P310 is not perfect – far from it – but its imperfections pale in comparison to the genuinely compelling offer that Lenovo has managed to put together here. The design of this workstation is excellent and when you factor in the cost of the Windows 10 Pro operating system, three-year onsite warranty and free delivery, you wonder how on Earth the Chinese PC vendor is making a profit out of this workstation. 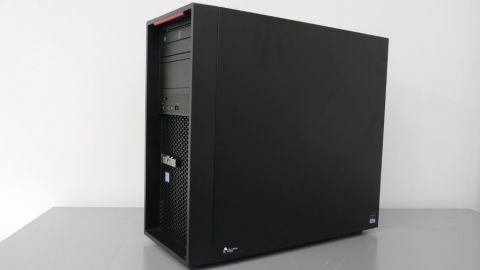 The test PC sent to us might have different components thrown in, but the underlying chassis remains the same and is a superb testament to the work achieved by the engineering and design teams from Lenovo. Note that a small form factor model of the P310 is also available but is not on sale at Lenovo’s online shop. You can only buy it from one of the many resellers online.